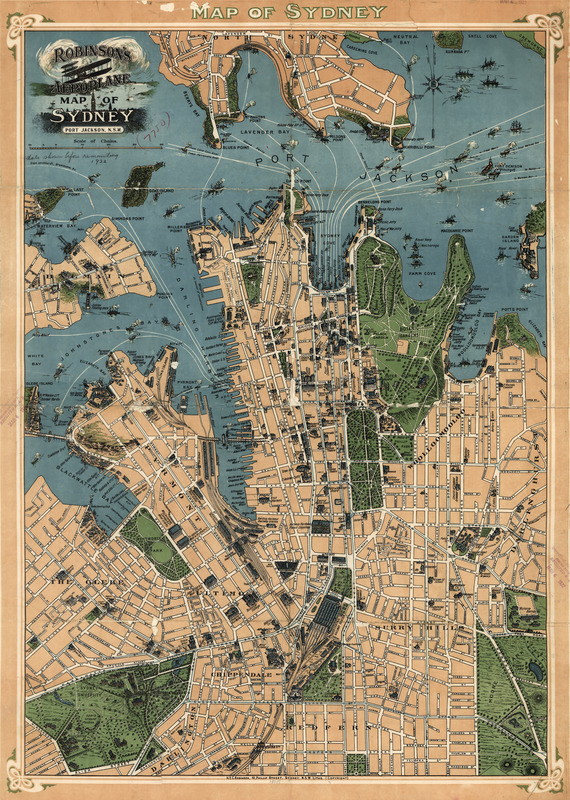 Fun-looking and quite expertly-rendered overhead map of Australia's most populous city: Sydney, NSW [gmap] in 1922. Now I've noticed a pattern here in the U.S. that may or may not hold true in all cases: City-wide maps depicting a bustling, ebullient maritime or rail trade (such as this one) are often commissioned by towns in their early "salad days", right on the cusp of a real or imagined population or industry boom. I imagine it goes something like this (if you'll excuse my ad hoc psychoanalytics) -- you've got a city, and it's on the cusp of greatness... everything seems like it's just about to pop off. Seems like it just needs some more population and it'll snowball from there. Makes sense that that's when you spring for the map/public works project/exposition that shows the world your can-do spirit. To folks that would know: What was it like in Sydney in the early 1920s? Does the pattern hold true, in this case? Well, they were just about to start work on the famous Harbour Bridge, so you might well be onto something. 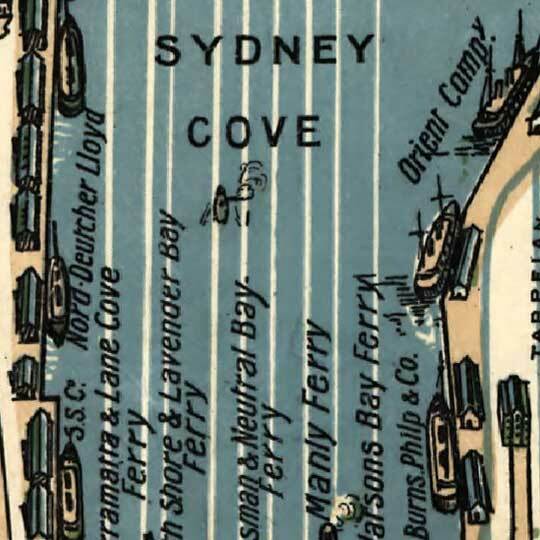 The bridge is anchored on Dawes Point, which you can see on the map up and to the left of Sydney Cove. Many thanks for the insight, Merus. Glad to hear from someone more well-versed in Sydney history. Also glad to hear more about the history of the Sydney Harbour Bridge [wikipedia link].